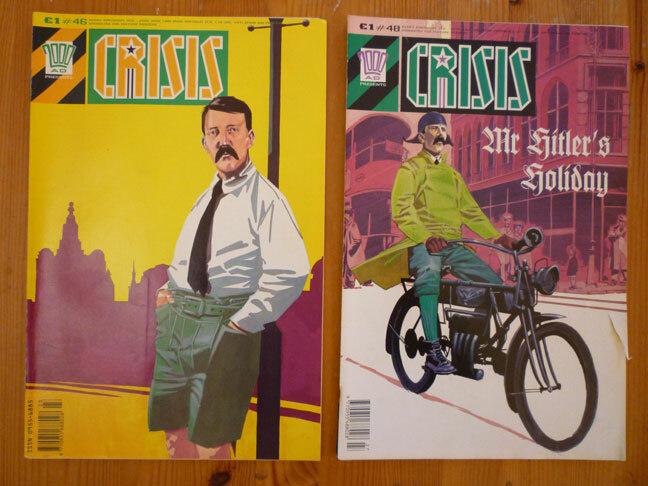 Almost forgot, I picked up some comics at the weekend too, in Brighton: Crisis issues #46–49. Crisis was a UK comics anthology published fortnightly by Fleetway in the late '80s, a kind of more mature, edgier spin-off from 2000 AD. There were a few interesting strips in it, notably Garth Ennis and John McCrea's Troubled Souls, about the so-called Troubles in Northern Ireland, and Peter Milligan and Brendan MCarthy's Skin, which featured a thalidomide skinhead. But the one I always wanted to read was Grant Morrison and Steve Yeowell's The New Adventures of Hitler – basically a humorous exploration of Hitler's (unsubstantiated) time living in Liverpool from 1912 to 1913.